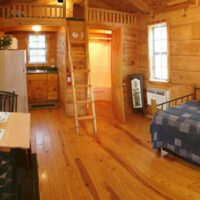 Our camping cabins are cozily furnished and can sleep two adults and two kids, This style of cabin has a twin trundle that can be connected to make a king size bed, And the kids always love the loft that has a full size foam mattress! You are still camping but just not in a tent, camper or RV, instead, you are camping in a rustic cabin where you can feel in touch with nature, see the natural wood beauty that surrounds you inside and out. 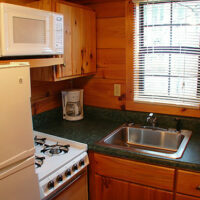 The Adventure Village camping cabins are constructed of Dovetail white pine logs. 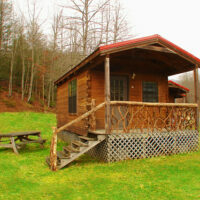 Like in the olden days and built into log cabins.